fair to good, some missing covers, worn but mostly legible. Lease email if you need to know which ones. Thanks, Mat. Bagged for Posterity. fair to good, some missing covers, worn but mostly legible. Please email if you need to know which ones. Thanks, Mat. Bagged for Posterity. Cripple Creek Short Line. Through the Heart of the Rockies Into the Land of Gold. "The one-Day Trip That Bankrupts the English language". Colorado Springs, Colorado, U.S.A.: Unknown, 1910 Very Scarce, 14 color views with a 2-page description of the trip. Undated, circa 1900-1910. Edgeworn, else near fine. Plates are 3.5"x5.5".. Folding Accordion Wrappers. VG. 32mo - 3.5" Tall, Oblong. Bagged & Boarded for Posterity. Cambridge: Metcalf and Company, 1849 16 pages, 2 small spots to the FC, else fine.. Wrappers. Near Fine. 12mo - over 6¾" - 7¾" tall. Bagged & Boarded for Posterity. 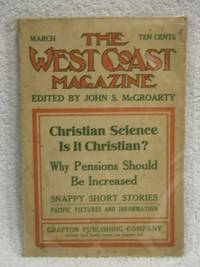 The Grafton Publishing Company 1911 Original Issue Magazine. Very good condition. Contains McGroarty "The Hundren and Forty-Third"; Graves, "Boyhood Days in Early California", and many other storeis and articles. Quite Scarce.. Bagged for Preservation. Human Life: A Magazine About People. August, 1910. Volume XI, Number 5. Interesting article about the attempt to make the Wright Brothers airplane patents public domain by this magazine. Wonder how that went! 32 pages, several photos, color ads (full-page on the rear of Coca-Cola) and other stories. 'Heinz.The Man, not the Pickle', Roosevelt, etc.. Illustrated Wraps. Very Good. Folio - over 12" - 15" tall. Bagged & Boarded for Posterity. Publisher: Chicago: W.B. Conkey Company, 1894. Fine Art Series Volume 1, #4. March 3, 1894.. Illustrated Wraps. Very Good. Oblong Folio. Bagged for Preservation.